Having nothing to wear, or being overwhelmed by your closet, are two very normal things to feel. In fact, the average person experiences “wardrobe panic” 36 times per year. But when you take it back to the basics, and narrow things down to only what you need, getting dressed becomes simple. Let us introduce you to the capsule wardrobe, a concept coined by a London boutique owner in the ‘70s. It’s a well-edited collection of only the most essential, timeless items of clothing, with a few additional pieces mixed in depending on the season. When creating your own capsule wardrobe, there are a few tips to keep in mind. Because the concept of a capsule wardrobe relies on owning fewer items that’ll get more wear, investing in quality is key. You’ll want well-constructed pieces that will stand the test of time—especially since you’ll be keeping them in your rotation for awhile. Clothing that fits properly has the ability to make you look and feel great. And when you have clothes that make you feel confident, we’re sure you’ll wear them all the time. That’s why, in addition to fit, it’s important to pay attention to textures and proportions. 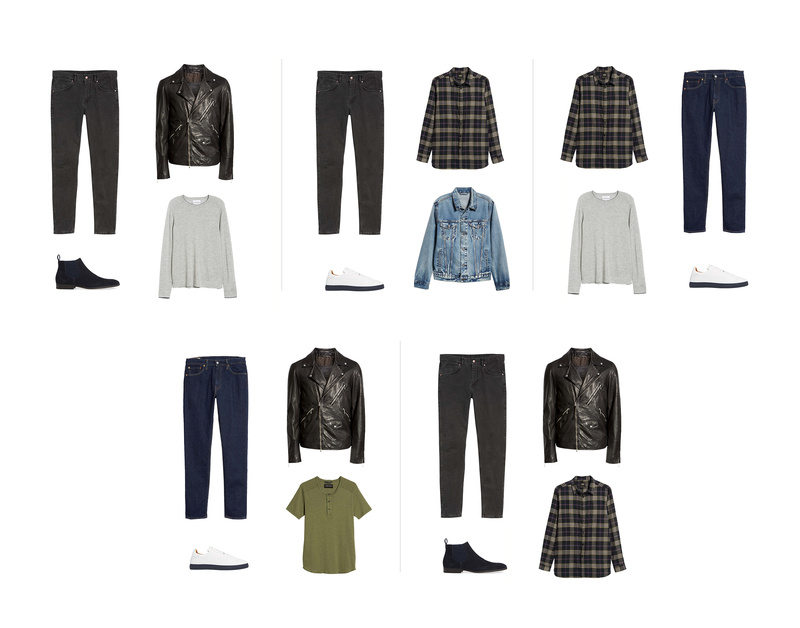 To help you visualize what we’re talking about, we’ve created capsule wardrobes for three popular men’s styles. 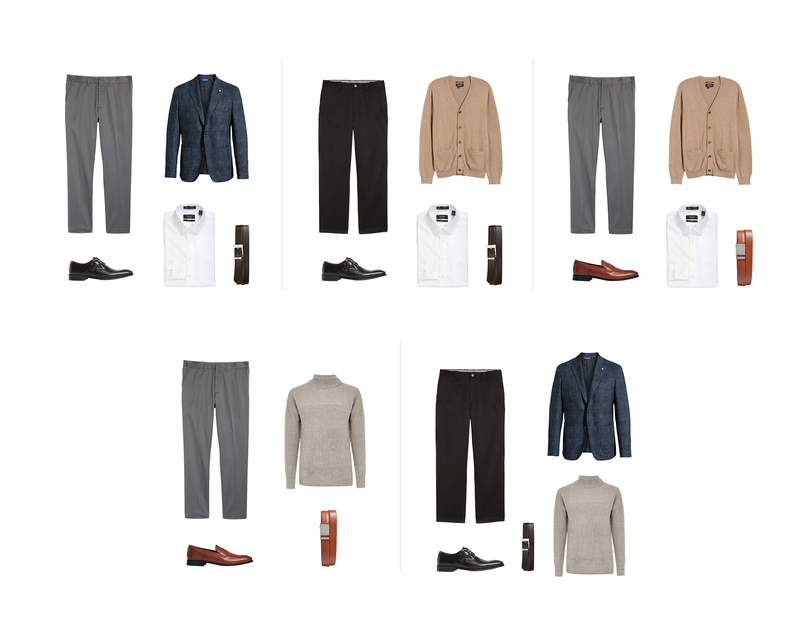 Using just 10 items, you’ll be able to create endless combinations by simply choosing pants, a shirt, shoes, and a layer. 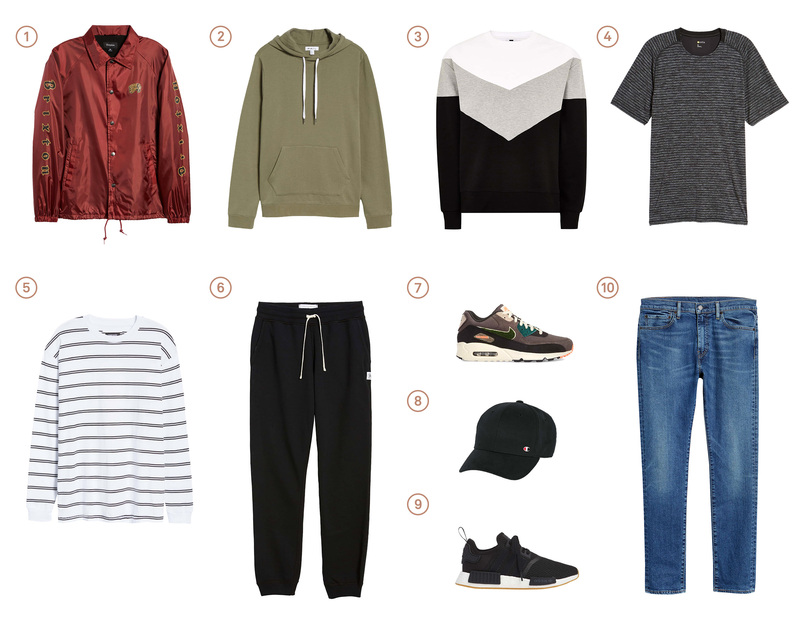 For the cool, casual guy who doesn’t mess with trends, this is the starting point for all your everyday looks. This collection of basics includes a couple styles of jeans, a casual shoe, and a dressier shoe. Layering is key, especially for fall and winter, so we’ve also included two different jackets. With this combo, a short-sleeve tee could easily be worn on its own, under a flannel, or with a moto jacket. 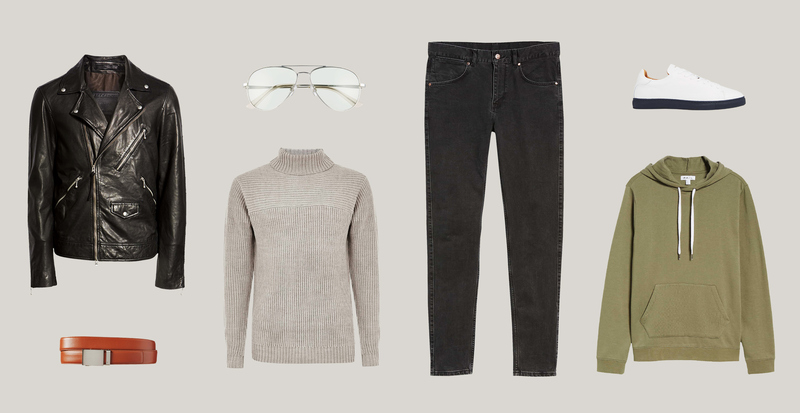 If you’re feeling up for it, try layering all three. 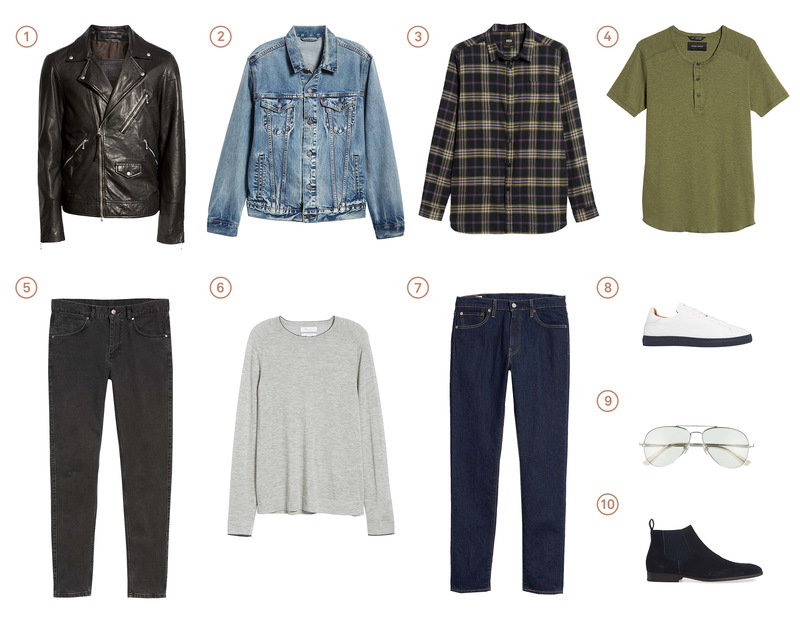 Seasonal additions could include: colorful denim, printed T-shirts, and weatherproof boots. 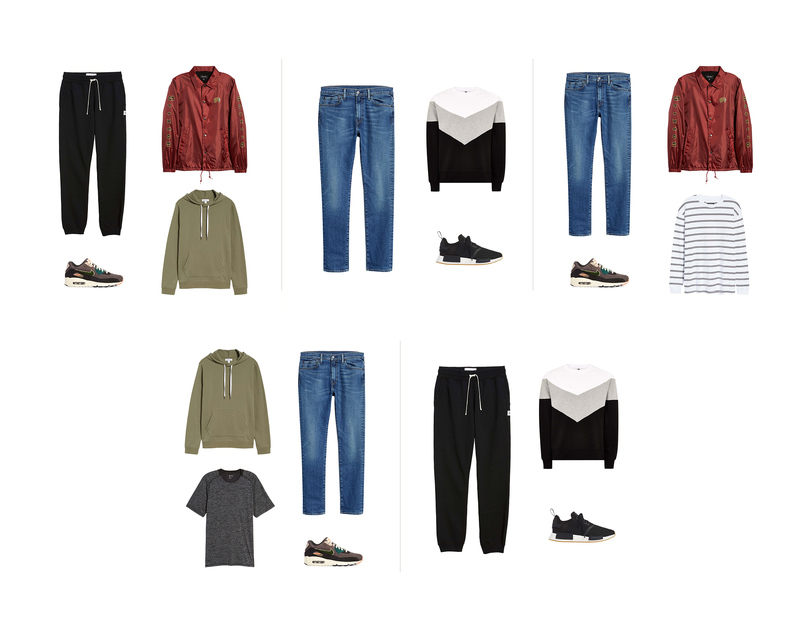 With this capsule wardrobe, you have the option to go full athleisure, weekend casual, or a mix of both. You have comfortable pieces, like joggers and hoodies, and then more polished pieces like jeans and graphic sweaters. Depending on the vibe, you can top things off with some fresh kicks, or go classic cool with sneakers in a neutral color. There’s no wrong way to style this one since it lends itself to being flexible. Seasonal additions could include: bright sneakers, a statement bomber jacket, and a puffer coat. This wardrobe is for the 9-to-5, Monday-through-Friday kind of guy. Because let’s be honest, you could wear a white shirt to work every single day, and as long as you occasionally switch up your tie and shoes, no one would know the difference. And that’s the point! A white shirt, neutral pants, and matching belt and shoes will never steer you wrong. On chillier days? 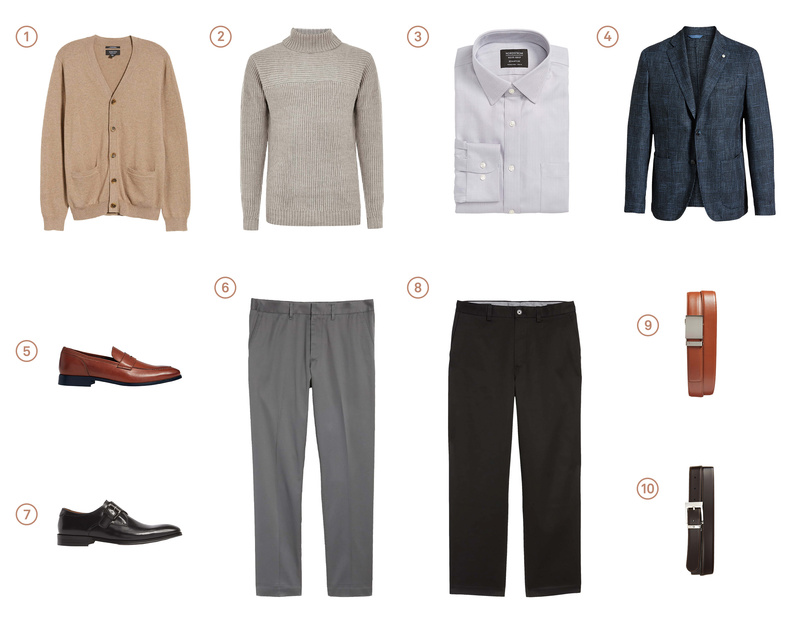 Simply layer on a sweater or a sport coat. Seasonal additions could include: patterned scarves, a multicolor pullover sweater, and a custom sport coat.